Funny article in hindsight. He was right about one thing - Wentz is no Luck, Mariota, or Winston! I guess that’s what compelled him to compare this year’s stats of Wentz and Luck in his most recent article - Luck is the only one of the three who comes close to matching up with Wentz. He also trashed Goff, who somehow was able to hold his locker room together enough to make a Super Bowl. Santoloquito is pretty good but his speciality is boxing. I assume he covered the Eagles for Philly Voice all year but that site it not what it used to be (when Rich Hoffman and Ryan Lawrence were still there). Kapadia's Athletic Q&A response today is pretty even-keeled. 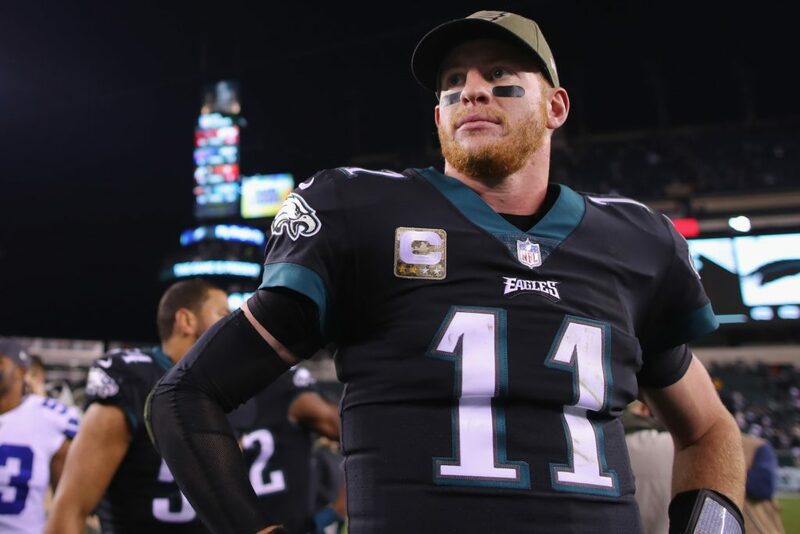 Is there a serious issue between Carson Wentz and his teammates? Should the Eagles move Rasul Douglas to safety? Sheil Kapadia answers those questions and more in his mailbag. I thought even Kapadia gave the idea too much credit. Every long-term Eagle that matters posed that the article was BS. I therefore conclude it was BS, published by a media member with a demonstrated long-term axe to grind and probably sourced from disgruntled ex-coaches and a few discontented players. There is nothing to this article. Nothing. I dont see a problem on this team with Wentz at all. Foles has been great, and is clearly a great teammate, no one doubts that. Who is the first guy to come over to Alshon Jeffries after he dropped the pass... Foles. And I can all but guarantee you Foles tried to say "I put to much mustard on it" or "it was a little high" or something like that. That is just the guy he is. Wentz is no different, I dont think you can find a single player on the offense that plays significant time that doesnt like the guy and respect his leadership, even if he is still a young player. QB is a position we have taken care of, we will miss Foles but it is time for him to go, make his money and give it "another shot" to have "his" team. I am not optimistic, because frankly he isnt taking Doug Pederson with him, and I think that Pederson is to a great deal the reason for his success the last 2 seasons. Rodney McLeod restructures his deal in order to stay with the Eagles. Not huge news, but very important as McLeod's steady play allows Jenkins to free lance more and make plays. Missing him for most of the season was a huge problem as Corey Graham just isnt the same level of player. Makes me wonder what they do with Avonte Maddox. Maybe Nickel or just keep floating him between Safety (injury replacment) and CB. Foles could do very well. He needs a good offensive line and RB. Primarily he needs a game plan suited to his abilities. Pederson gave him that. There are other coaches who will also give him the best chance to succeed. If he becomes some coach's square peg to be rammed into a predetermined round hole system,, then he will fail. I agree Wentz will do well. He needs to be healthy, which he wasn't this year, which killed his mobility and ability to hit his WR targets. He really does need the discipline to throw the ball away when that is needed. Pederson needs to call plays where Wentz can look downfield from the moment of the snap. He is not as fast a reader as Foles and if he is required to take hits and depend upon elusiveness to get free of tacklers who appear in his face the moment he turns back from a fake handoff, his career is going to be short. Nick Foles' price just went up quite a bit. I'm sorry to see the Patriots win another SB, but it's a plus sign for the Eagles' future to see how far from invincible Goff and the Rams are. Did they play a much better game last year? I thought that, on the defensive side of the ball, the Patriots played a great game. Which they were not able to do vs. Foles/Pederson. We had a lot more open guys, and Foles hit them. We also ran the ball way better. Goff missed the open guys he threw to, and didn't throw to the right receiver on many occasions. So, you can give the Pats credit for that, but, if you do, you have to really give credit to the Eagles last season. Many pundits opined that Foles' value went way up after that game. We've also done much better offensively vs. the Rams' D than the Pats did last night. Goff was awful last night. Awful enough that he will have a hard time living last night down going forward? Eagles did a lot better offensively vs Pats, Rams did a lot better defensively than we did. Perhaps Brady is in serious decline or more likely we need improvement at DB and LB. Perhaps Brady is in serious decline or more likely we need improvement at DB and LB. Perhaps it was scheme and not personnel, too. A lot of people up here feel it is Gronk that is in serious decline. Not much talk of Brady being old coming out of KC, so one game …? Eagles did a pretty good job defensively last year in the first half; it was the fact they couldn't match up with Gronk in the second half that permitted Brady to get on a roll. Some talk about TB12 not being viable for a TE, but I think it is more cumulative than that with Gronk. There also was a lot of DB contact and hand play going on throughout the game that wasn't called. Personally I'm ok with that because it disgusts me how much WR pushing doesn't get called, but maybe that is what is needed to score 44 points like the league wants. Yeah, one thing that gets under-evaluated in all of our comments is the scheme, probably because few of us understand it beyond a HS level. You realize that when you listen to a guy like Romo and what he immediately sees in a defense while I'm still staring at whether the lineman are lined up on side. In that vein to a degree, seeing Chung still playing effectively at safety in a defense that is always good makes you also realize how much a different scheme can impact a player's performance. Has there ever been a better example than watching his fiasco of a year in Philly followed by his return to NE? What does it really mean to say that Foles' value went up last night though? That a team would actually give the Eagles more to get him for just one year? Or that it is smarter than ever for Foles to wait for free agency? I gotta think his value is pretty static, based on his contract. Unless, that is, the scenario is he is willing to negotiate with an acquiring team and lock down a long-term deal before he actually plays another season (which could lower his value). From the news over the weekend it sounds like the Eagles expected to franchise him and take what they can get, which would merely represent a slight upgrade over FA compensation. I suppose the other takeaway is that the fantasy that he sticks around and takes a pay cut remains just that. The reason to franchise him is to control what team he goes to. I don’t think the Eagles want him going to the Redskins or Giants.